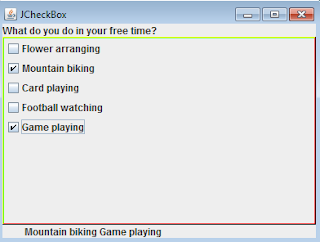 JCheckBox represents a check box item that can be turned on or turned off. You can turn on or turn off a number of items. The JCheckBox component can generate item event so you need to use the ItemListener interface to receive the event. Alternatively, you also can use the AbstractAction class that implements the Action Interface to handle the action event that is generated by the JCheckBox as you can do with JButton. creates a new checkbox with specified text. creates a new checkbox with specified text and selection state. creates a new checkbox with properties taken from the implementation of the Action interface. creates a new CheckBox with an image icon. creates a new CheckBox with an image icon and specified selection state. creates a new checkbox with specified text and image icon. returns the text of the checkbox. 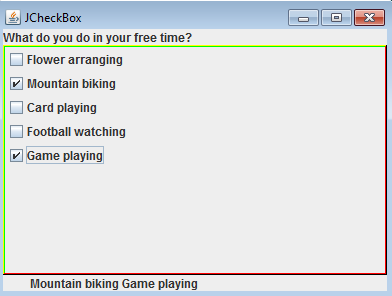 determines whether or not the checkbox is selected. sets the text of the checkbox. To get the number of components added to the container, you can use its getComponentCount() method. If you want to visit every component of the container, you will need to use a loop. Each component in the container can be retrieved by using its getComponent(int index) method.